The NuCalgon NP24PC purifies, treats for scale, and removes odors. Purified through blown-microfiber polypropylene removing particulate down to 10 microns. Then treated with Micromet® 6R that inhibits lime scale formation. Finally odors and chemicals are removed through activated carbon. 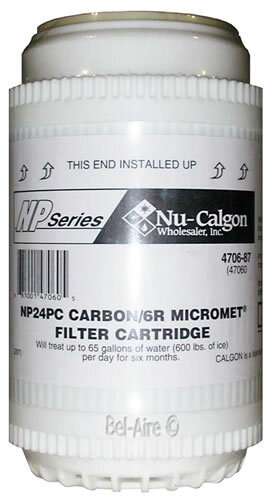 The NP24PS cartridge can treat up to 65 gallons of water per day for six months. Micromet dissolves slowly into the water and stabilizes the hardness minerals, thereby preventing scale formation. Made with FDA-approved materials. Model NP24PC, Part Number 4706-87.